Happy "student group feature" Thursday, alumni! This week's spotlight is on a group that does a lot for our community. We're excited to share with you the Community Service Board! Members: Seniors: Sam Tabet, Isabella Bredwell, Anthony Peay and Claire Goodson. Juniors: Eleanor Campbell, Vice Presidents: Seniors Charlotte Jones and Remy Fleischman, Caroline Rutigliano, Shaurik Deshpande and Charlotte Tannenbaum. Sophomores: Nabeel Sabu, Caitlyn Hankins, Rachel Vorhees and Bruce Zhu. 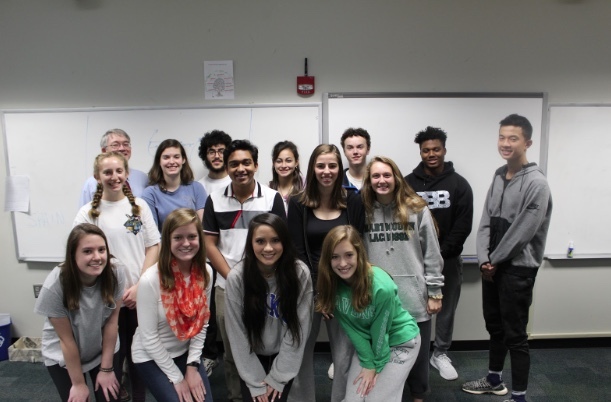 Group Description: The Community Service Board oversees service events and clubs at Ravenscroft to ensure smooth operation while also managing a schoolwide calendar called RavenToday. What is your favorite activity that your group did on or around campus? : One of our group's favorite part of the Community Service Board is helping organize and plan the Club Bazaar every September. At the Club Bazaar, clubs set up booths in the quad and recruit members for the upcoming school year. This is always a really fun day for upperclassmen to take leadership positions in clubs and for underclassmen to find ways to get involved in the Upper School community. Something most people don't know: A lot of people may not know that on Day 3s, we meet with the leaders of any upcoming service events, helping them plan and giving them advice based on similar events from the past.